Product #17555 | SKU KIWI | 0.0 (no ratings yet) Thanks for your rating! 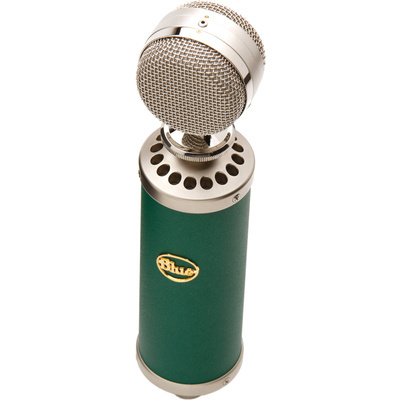 The Kiwi Microphone from Blue features a large diaphragm condenser configuration and offers a multi-pattern, dual single-back-plate variation of the company's B6 capsule. It offers 9 selectable polar patterns, including cardioid, omnidirectional, and figure-of-eight, with 6 intermediate variations. The Kiwi has a transformerless design to provide a clean audio path and does not contain any pads or filters between the capsule and the mic circuit. It provides a modern vocal sound and can be used with a variety of sources, including acoustic guitar, piano, percussion, brass, and woodwind instruments. The S3 shockmount is included along with a wood storage box.